This entry was posted in Campus Announcement, General News and tagged Hubbard, Research, speaker, trustees on June 22, 2012 by Wire Eagle. 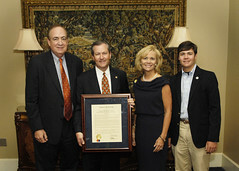 AUBURN UNIVERSITY – The Auburn University Board of Trustees on June 22 voted to name a new facility at the Auburn Research Park after Alabama House Speaker Mike Hubbard. In appreciation of his support in advancing the university’s academic mission and role in economic development, the board named the building the Mike Hubbard Center for Advanced Science, Innovation and Commerce. Hubbard was instrumental in securing half of the $28 million that is being used to build the center. This entry was posted in Campus Announcement, Events and tagged commencement, gibbs, robert, speaker on April 19, 2011 by Wire Eagle. AUBURN – Robert Gibbs, a longtime advisor and strategist to President Barack Obama and former White House press secretary, will deliver the commencement address to Auburn University graduates at the spring ceremony May 9. Auburn will award an estimated 3,139 degrees during the 9:30 a.m. ceremony, which will mark the first commencement exercises to take place in Jordan-Hare Stadium since 1968. A live video stream of the event will be available on the university’s website at www.auburn.edu/graduationlive. An Auburn native, Gibbs graduated from Auburn High School in 1989 and North Carolina State University in 1993. This entry was posted in Events and tagged politics, speaker, women's studies on February 24, 2011 by Wire Eagle. Reservations for the luncheon can be made at http://media.cla.auburn.edu/womens_studies/luncheonForm.cfm through Wednesday, March 2. This entry was posted in Campus Announcement, Events and tagged graduation, speaker on May 1, 2008 by Wire Eagle. AUBURN – General Richard B. Myers, retired Chairman of the Joint Chiefs of Staff and a graduate of Auburn Montgomery, will deliver the commencement address to Auburn University graduates at spring ceremonies May 10. AU will award an estimated 2,687 degrees during two spring commencement ceremonies in Beard-Eaves-Memorial Coliseum. A live video stream of the events will be available on the university’s Web site (www.auburn.edu/graduationlive).